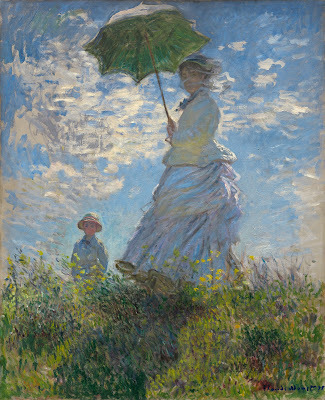 Study of a Figure Outdoors: Woman with a Parasol, facing left, 1886.
second wife of Claude Monet, Musée d'Orsay. 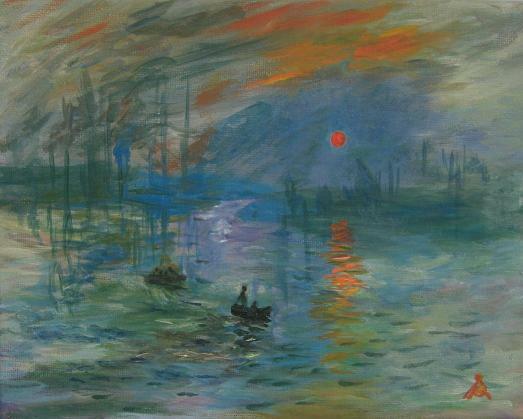 Claude Oscar Monet was born 14 November 1840 in Paris. Monet's father was a Grocer, so one would think that his early subjects would be groups of grocery items, but he loved the outdoors and his early paintings often focused on water. Although born in Paris, he was raised in Le Havre. There he was heavily influenced by Boudin who painted dreamy seaside scenes. Later Claude was to have a special boat built where he could paint under cover yet still "plein air". 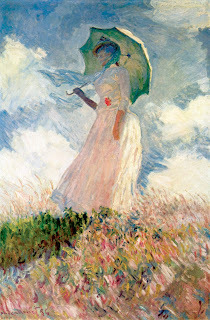 Monet painted scenes in Le Havre, Paris, Giverny, London UK, Holland, and Belgium. 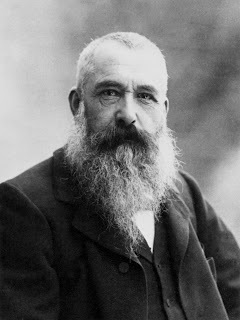 Claude Monet is the most famous Impressionist. 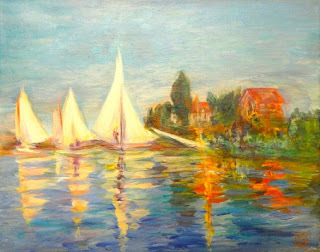 He was involved in organizing the Impressionist exhibitions and his painting "Impression Sunrise" was exhibited at the first Impressionist exhibition and bore the name by which the group would become known.The early impressionists mainly lived in the vicinity of Paris and often shared work space. 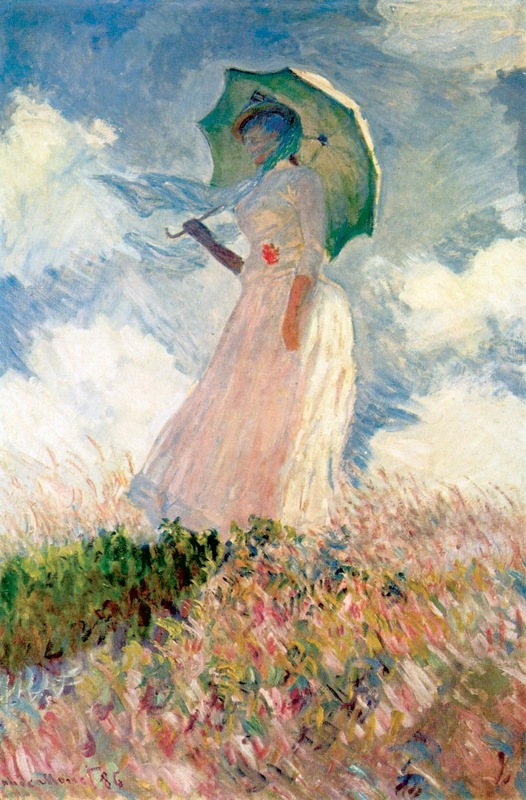 Monet worked with most of them, as well as pre-impressionists Boudin, Manet and Renoir. In 1923 His eyesight started to fail and he underwent cataract surgery. His paintings grew larger and the colours more complex and subdued as his eyesight worsened. 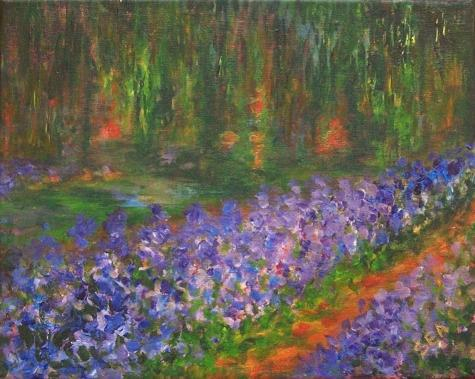 The majority of his later works were inspired by his beautiful garden at Giverny near Paris. On 5 December 1926 he passed away to the home he loved in Giverny. How do you choose just one Claude Monet painting? Any one you pick is a masterpiece. I chose the top one because I saw two of the series when I was in Paris and they were phenomenal. What really struck me was not the famous rendition of light, but the treatment of the grass. The paintings in the Musee d'Orsay are large and hang high so the grass is at eye level for all but the very tall. 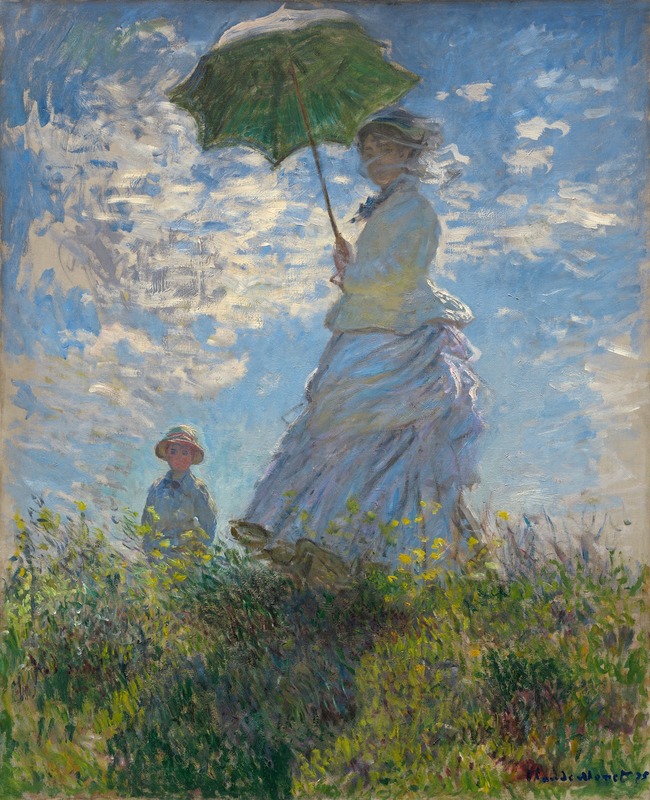 The other interesting thing about the upper and lower renditions of a female with a parasol is that they depict Monet's first and second wives and I think show the difference in his feelings towards his two loves. My Daily Paintworks pieces today were created as demos for my Paint a Masterpiece Class. Larger originals or prints may be available by contacting me. This is one of the most famous paintings of all time. It gave it's name to one of the most important art movements influencing artists today. 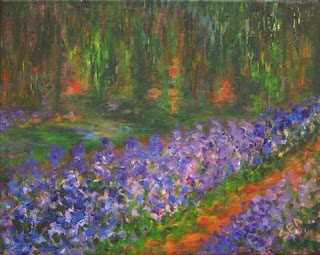 That strange green/ blue/ grey colour is a signature of Monet's later works and can be seen in his water lily series as well as many other floral works.